As the New England Patriots and Los Angeles Rams play in Super Bowl LIII on Sunday, the rest of the league is, to steal a phrase, on to 2019. The other 30 organizations might sneak a peek at the television -- Doug Marrone aside -- but after chasing down everyone Sean McVay is friends with on social media, the league's runners-up are now spending time planning out their roster cuts, scouring college tape for the draft, and preparing for free agency. Likewise, while I have a Super Bowl preview coming later this week, I have thoughts about where each of the league's franchises might look under a totally different light in 2019. During the spring, Vegas sportsbooks post over/under marks for the upcoming season and give a general estimate of where they expect each team to land in the months to come. Those numbers are generally designed to attract even amounts of money on either side of the bet, although there are some exceptions I'll get to later in this piece. I'm going to give my projections for where those over/under marks will land when the books open their 2019 totals for betting. In the process, I have to make some educated (and/or wild) guesses about what will happen in the months to come for players such as Antonio Brown and Cam Newton, whose 2019 home and status, respectively, remain unclear. I don't know where the major free agents will go or whether veteran players will retire, but I do have each team's schedule and their advanced metrics from the 2018 season to help guide the way. Before we get started, I have to make one thing clear. This is not my projection of how each team will finish in 2019. I'll have my own thoughts on that as we hit the summer. This is merely trying to estimate what Vegas will set as the average expectation for each of the league's 32 teams in 2019 this spring. The list has to start somewhere, and the natural beginning point might as well be the worst team in football. The 3-13 Cardinals fired coach Steve Wilks and replaced him with Kliff Kingsbury, who has no NFL coaching experience and was fired by Texas Tech. Years of poor drafts have limited the Cardinals to a few precious stars, and while it's unfair to judge Josh Rosen after he spent 2018 playing behind backup linemen, the Cardinals probably won't be able to address all of their issues on offense in one offseason. A trade out of the No. 1 overall pick might help. A division with two playoff teams and a returning Jimmy Garoppolo in San Francisco also means the Cards will play one of the tougher last-place schedules in the NFL. It's hard for a team to be this bad in back-to-back seasons, which is why the line builds in a 1.5-game improvement and has juice going over 4.5 wins, but the Cardinals don't have much going for them heading into 2019. The Cardinals at least have a home, which might be more than we can say for the Raiders. The Raiders don't have a lease for the 2019 season. They've already lost one home game to the schedule-makers, as they will host the Bears in London. Oakland's roster is a work in progress, as just about everyone who wasn't acquired by Jon Gruden is likely available for trade or subject to release this offseason. The Raiders have four of the top 35 picks in this year's draft, but given Gruden's track record with personnel, should they really be expected to make an immediate impact? Ownership has already suggested that the Dolphins need to rebuild after years of mismanagement under the previous regime of Adam Gase and Mike Tannenbaum, which repeatedly tilted at windmills in the hopes of stumbling on a sustainable roster or team culture. They could draft a quarterback, which would likely mean the end of Ryan Tannehill's tenure on the roster and $13.4 million in dead money on Miami's cap. The likes of DeVante Parker, Andre Branch and Danny Amendola could follow Tannehill out the door, while Miami's 7-9 record included a 5.2-win Pythagorean expectation, suggesting the team is likely to decline in 2019. The Bills would benefit from a weakened Dolphins team, and after spending the past two years clearing out cap space, general manager Brandon Beane projects to have more than $80 million in room to build infrastructure around Josh Allen. With a weak crop of offensive talent waiting in free agency, though, the Bills might not be able to add enough in support for their young quarterback. There are also still plenty of questions about Allen, who needed a late surge to finish with a 67.9 passer rating, the 14th-worst mark for a quarterback in a 300-attempt season in league history. Sean McDermott's defense has ranked among the best in football over the past two seasons and should continue to carry the load in 2019. Optimistic fans might note that Washington was 6-3 before Alex Smith broke his leg and was down to Josh Johnson by the end of the season, but even during that 6-3 stretch, the team had outscored its opposition by a combined one point, and its Pythagorean expectation suggested Washington was playing like a .500 team. Washington also has just $15.5 million in cap space to work with and may need to replace Smith, who has a guaranteed $15 million base salary coming in 2019 and might never be able to play again. Washington has an underrated defense and a great offensive line when healthy, but unless it adds another quarterback, its ceiling with Colt McCoy is capped. Jets fans are excited about their future with Sam Darnold, and the team could easily top $100 million in cap space this offseason. As I suggested with the Bills, though, there might not be many offensive weapons worth investing in this offseason, as a desperate franchise might look to hand Le'Veon Bell a blank check to win the back pages in New York. General manager Mike Maccagnan's spending record in free agency is spotty at best. New coach Adam Gase also failed to impress during his time in Miami, although he hasn't had a young quarterback to work with like Darnold since, well, Tim Tebow in Denver. The perennial breakout pick will be among the favorites to take a step forward in 2018, given that the 5-11 Buccaneers went 3-6 in games decided by a touchdown or less and replaced Dirk Koetter with wise sage Bruce Arians, who went 29-12-1 in those same games with the Colts and Cardinals. The issues are, well, also perennial: Jameis Winston is unreliable on and off the field, the defense is coming off a horrific season, and the other three NFC South teams have a more plausible path to the postseason. Chances are that the Bucs will improve, but new coordinator Todd Bowles would need to turn around a woeful Bucs defense overnight to get Tampa into playoff consideration. The Bengals seemed like a lock to hit or go over their Vegas preseason total of seven wins when they reached their bye at 5-3, but a dismal defense and injuries to Andy Dalton and A.J. Green helped sink their offense during a 1-7 second half. The collapse finally prompted the Bengals to make a coaching change, although Rams quarterbacks coach Zac Taylor, the man who's expected to take the reins in 2019, doesn't even have a full season of playcalling experience at the professional level. Taylor is reportedly considering hiring Jack Del Rio as defensive coordinator, and it could be the most important move Cincinnati makes this offseason, given the success Del Rio had in that role with the Broncos. Perhaps the league's most disappointing team in 2018, the Jaguars fell by five wins in dropping to 5-11. Ownership resisted the urge to make offseason changes to the coaching staff or front office, but after years of spending in free agency, the Jags are $10 million over the projected cap for 2019 and will realize only $4.5 million in savings by releasing beleaguered quarterback Blake Bortles. Malik Jackson and Carlos Hyde are likely to follow Bortles out the door, while the future of Leonard Fournette with the Jaguars remains uncertain after the team attempted to void the remaining guarantees in his contract following a suspension. Jacksonville's over/under could rise if it finds a serious upgrade at quarterback; of course, given that the Jags doubled down on Bortles last offseason, they might not be very good judges of quarterback play. The Lions had a bizarre season in the AFC East alone; who would have projected that the Lions would blow out the Patriots, comfortably beat the Dolphins, and then lose to the Bills and Jets? Matt Patricia's team was 23rd in offensive DVOA and 27th in defensive DVOA, so Patricia promptly fired offensive coordinator Jim Bob Cooter and replaced him with former Seahawks coordinator Darrell Bevell. The Lions have yet to fill many of their holes on defense, as hiring Patricia was no immediate salve. They'll need to make investments on that side of the ball this offseason to improve much on their 6-10 mark. The Giants might be one of the rare teams both the public and sharps expect to improve in 2019. Teams with long-standing fan bases tend to attract more over action from tourists visiting Vegas, which is why the likes of the Giants, Cowboys and Bears have higher-than-expected lines most seasons. Pat Shurmur's team went 5-11 with a seven-win Pythagorean expectation, suggesting the Giants are one of the most likely teams in football to improve next season. If any team is going to benefit from a Cowboys decline, it's likely the Giants, although they might need to improve upon Eli Manning at quarterback to rise much beyond 7-9 or 8-8. John Elway's Broncos are another team likely to improve in 2019, as they were ravaged by injuries along the offensive line and still managed to post a 7.4 Pythagorean expectation, leaving Denver comfortably ahead of its 6-10 record. By DVOA, the Broncos ranked 13th in the league, ahead of playoff teams like the Eagles (15th) and Cowboys (21st). Their ceiling is probably limited by the difficulty of playing in the AFC West and the inconsistent play of Case Keenum, but if new offensive coordinator Rich Scangarello can protect Keenum, the Broncos have more upside than you might see at first glance. If we were actually posting these odds at a sportsbook, the Panthers' line would likely be off the board until there's some clarity about Cam Newton's 2019 status. Since I have to post a number for every team, though, this is a best-fit line based upon a wild guess at Newton's health. This number projects that Newton has a 60 percent chance of entering the season healthy, a 25 percent shot of missing the first four weeks of the year, and a 15 percent chance of missing the majority of the season. Given that the Panthers are losing veterans such as Thomas Davis and Ryan Kalil and need to rebuild their depth on both sides of the line of scrimmage, this could be a difficult year even if Newton is on the field in Week 1. After years of ranking as the lowest over/under on the board, the Browns aren't a joke anymore. Baker Mayfield & Co. would have come narrowly short of this total at 7-8-1 in 2018, as ties count as losses for the purposes of these bets. With a young core and Hue Jackson safely ensconced outside of the Cleveland metropolitan area, it would be reasonable to expect the Browns to improve in 2018. What might hurt the Browns, though, are some of the factors that pushed them to success in 2018. Their schedule will be tougher, as they got to face Jeff Driskel for one and a half games vs. the Bengals, while the move up the standings will get the Browns a third-place schedule in 2019. Cleveland's turnover margin was extremely likely to improve in 2018, but its plus-7 mark could be tough to keep up. Teams that improve as much as the Browns did in general often have a consolidation year; 67 of the 89 previous teams (approximately 75 percent) that improved by five or more wins since 1989 declined by at least one win the following season. The 49ers will be an easy pick to improve in 2019. Obviously, they're getting back Jimmy Garoppolo, and while there's no guarantee he will play 16 games, chances are that the 49ers will get more than three starts out of their top quarterback in 2019. Injuries to many of the 49ers' other skill-position weapons aren't likely to all simultaneously recur. The 49ers forced just seven takeaways on defense and posted a minus-25 turnover differential, which often regresses toward the mean, as it did for the Browns, who went from minus-28 in 2017 to plus-7 in 2018. Kyle Shanahan's team went 3-5 in one-score games and played more like a six-win team than its 4-12 record. The NFC West remains difficult, but if any team is likely to leap from the bottom quarter of the league into the postseason in 2019, it's the Niners. After a disappointing season, the Falcons fired both of their coordinators and went back to what worked in the past. Their offensive staff now includes Dirk Koetter and Mike Mularkey, both of whom are former Falcons offensive coordinators. Dan Quinn added defensive coordinator duties to his role as coach. Atlanta will hope that the familiar faces can bring new life to a team that never seemed to click on both sides of the ball at the same time in 2018. If Quinn can get a defense that ranked 31st in DVOA back toward the middle of the pack, the Falcons should be able to make the playoffs. With just $4.7 million in cap space before addressing Grady Jarrett's free-agent status, however, the Falcons don't have the flexibility to make major additions on either side of the ball. The league's most confusing team was wildly inconsistent in its debut season under Mike Vrabel; while the 9-7 Titans soundly defeated the Patriots and finished the season with four wins over playoff teams, they lost to the Dolphins and Bills and were swept by a combined 44 points in two losses to the Colts, with the second costing Tennessee a playoff spot. The Titans lost offensive coordinator Matt LaFleur to the Packers, and while they promoted Arthur Smith to try to secure some stability, Marcus Mariota will be on his fifth offensive coordinator in five seasons. With Mariota yet to complete a full 16-game season as a pro and the AFC South going up against the AFC West and the NFC South in 2019, the Titans could struggle to hit nine wins for the fourth consecutive campaign. Matt LaFleur's new team had a shockingly disappointing 2018, as it managed to get a 16-game season out of Aaron Rodgers and still went 6-9-1, which cost Mike McCarthy his job. I think it was time for McCarthy to go, and the lack of interest in hiring McCarthy around the league suggests that he wasn't seen as a great coach, but it's also fair to note that the move doesn't guarantee success. Fans were thrilled when the Packers promoted Ted Thompson and new general manager Brian Gutekunst actually spent money in free agency, but his first class delivered Jimmy Graham, Tramon Williams and Muhammad Wilkerson, who failed to make an impact thanks to injuries and aging. LaFleur isn't McCarthy, but the 39-year-old might not turn out to be an upgrade, either. Cowboys fans will likely see this as easy money, given that Dallas went 7-2 after trading for Amari Cooper and won't have any cap constraints preventing Jerry Jones from retaining the team's core contributors. The reality is that few teams project as more likely to decline than the Cowboys, who played more like an 8.4-win team all season and will face a first-place schedule in 2019. Dallas finished the year 8-2 in games decided by seven points or fewer, and nothing about its track record under Jason Garrett suggests it will be able to keep that up. Likewise, the Colts ran a furious second-half stretch into the postseason, where they won in Houston in the wild-card round before getting blown out by the Chiefs. 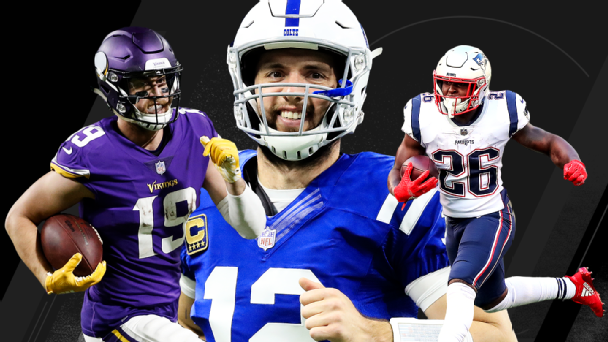 They're in great shape for the future with Andrew Luck, a strong 2018 draft and more than $115 million in cap space heading into this offseason, but they played the league's easiest schedule in 2018. Indy will play a second-place schedule in 2019 and goes up against the NFC South and AFC West, so it is likely to face tougher competition. The Seahawks made an unexpected return to the playoffs this season, thanks in part to their home turf; Russell Wilson& Co. were 6-2 at home, with their only losses coming against the Chargers and Rams. Their 4-4 record on the road included losses to the Broncos and 49ers. Assuming the Seahawks place the franchise tag on pass-rusher Frank Clark and let star safety Earl Thomas leave in free agency, Seattle will have about $35 million in cap space, but that money might go to extending Bobby Wagner and Wilson. It remains to be seen whether the team's run-heavy approach will work as well in 2019. Bill O'Brien's team is top-heavy and predicated upon a core of star players staying healthy and playing at a high level. In 2018, those players mostly did: Deshaun Watson, DeAndre Hopkins, J.J. Watt, Jadeveon Clowney, Tyrann Mathieu and Benardrick McKinney combined to miss one game all season, and four of the six delivered Pro Bowl campaigns. Instead, the Texans' secondary pieces such as Will Fuller, Demaryius Thomasand Seantrel Henderson missed serious time with injuries, and while the core carried them to the postseason, an injury to Hopkins was enough to stifle the offense in a frustrating loss to the Colts. Those stars aren't as likely to be as healthy in 2019, although the Texans will have three top-55 picks after sitting out the first two rounds of the 2018 draft. Baltimore continues to profile as a better team by advanced metrics than by on-field performance; after going 9-7 with 10.4 Pythagorean wins in 2017, it improved to 10-6 with 10.8 Pythagorean wins in 2018. The Ravens should force more takeaways in 2019 after the same defense that racked up 34 in 2017 fell to 17 this season, but they'll play a first-place schedule, which means they'll get the Chiefs and Texans in lieu of the Chargers and Colts. The perennially cap-strapped Ravens also won't realize many of the savings after they move on from Joe Flacco until 2020, given that they would eat $16 million in dead money with a Flacco trade. That would leave Baltimore with $41 million in cap room, but it will need to use that room to re-sign C.J. Mosley and John Brown and to start working on deals for restricted free agents Patrick Onwuasor and Michael Pierce. It seems like the Vikings cycle between wildly successful and despair-inducing seasons from year to year under Mike Zimmer, but in the bigger picture, they've won an average of 9.5 games in their five years under the former Cowboys and Bengals assistant. Minnesota doesn't have much cap room after the Kirk Cousins deal and could lose Sheldon Richardson, Anthony Barr, Dan Bailey and Latavius Murray this offseason, but if you ask Vikings fans, Richardson might be the only one in the bunch they'll miss. With the Carson Wentz tempest quickly struck down on Twitter by what seemed like most of the Eagles' locker room, Philadelphia should have no issues contending again in 2019. The concerns with Wentz are instead about health and what the Eagles do if their star quarterback can't stay on the field in 2019. Nick Foles will likely leave for a starting job one way or another this offseason, and the Eagles might not be able to afford a significant replacement, given that Philly will have about $4 million in cap space after Foles comes off the books while Brandon Graham, Chris Long, Ronald Darby, Jordan Hicks and Darren Sproles all hit unrestricted free agency. The Eagles would benefit from a Cowboys decline, although by DVOA, the 2018 team was the worst edition of the Doug Pederson era and finished with the exact same DVOA -- 0.0 percent -- as the Giants. Will Antonio Brown still be on this roster in August? This projection would be at 10.5 wins if I felt more confident that the Steelers would work something out with their star receiver; remember that in what felt like a disastrous 2018 season, the Steelers still went 9-6-1. Assuming that the Steelers end up amassing draft picks for their mercurial wideout, Pittsburgh will run things back in 2019 with a second-place schedule, although the division rotation within the AFC means Mike Tomlin's team will still manage to play the Patriots for the fifth consecutive season. Their biggest concern is Ben Roethlisberger falling off of a cliff as he enters his age-37 campaign. For years, the Chargers underperformed their point differential and posted a dismal record in close games. The 2017 Chargers posted a 10.4-win Pythagorean expectation and went 9-7, which is why they were likely to get better the following season. The 2018 Chargers posted an identical 10.4-win expectation, but Philip Rivers& Co. improved to 12-4. Chances are they'll decline some in 2019, but they'll also presumably get something closer to a full season from star pass-rusher Joey Bosa. One thing seems certain: The same team that went 7-20 in one-score games from 2015 to '17 won't be able to repeat its 5-1 mark in those same contests last season. The Chargers also lose a home game to Mexico City. Matt Nagy's team returns virtually everyone on the field from the 12-4 Bears of 2018, but they'll be without stud defensive coordinator Vic Fangio after the Broncos poached the 60-year-old to take over as coach. Their dominant defense might struggle to lead the league in takeaways and rank among the healthiest units in football for a second consecutive season, but will improvement from Mitchell Trubisky and a young offense be enough to offset any defensive decline? All Patrick Mahomes did during his first season as a starter was likely win league MVP. What's on tap for his second season at the helm under Andy Reid? After firing defensive coordinator Bob Sutton, the Chiefs clearly hope to build a better defense to capitalize on their dominant offense. Mahomes & Co. became the second team in league history to score 30 or more points in a game and lose four times in one season (playoffs included), joining the 2002 Chiefs in the process. Those Chiefs went from 8-8 to 13-3 the following year. The 12-4 Chiefs can't make that sort of leap, but if they can get something close to a full season out of Eric Berry, they might not need the offense to score 35 points per game. The NFC champions are likely to suffer some slight drop-off in 2019, as the 13-3 Rams played more like a 10.9-win team during the regular season. A 6-1 record in one-score games goes a long way. Barring an injury to Jared Goff, Sean McVay's team should be able to ride a devastating offense and its big-play defense to another double-digit win total. I might have placed Todd Gurley within that caveat a month ago, but after the emergence of C.J. Anderson, the Rams almost have to bring back the former Broncos starter into the fold for a full season in 2019, right? The Rams don't always have traditional home-field advantage, as their playoff game against the Cowboys showed, but they're losing one home game to a London trip against the Bengals this upcoming season. Arguably the most complete team in the league on paper, the Saints saw Drew Brees fade badly over the final two months of the season. As Mike Sando pointed out on my podcast, the 40-year-old Hall of Famer was playing like an MVP candidate and posting a league-best Total QBR of 88.1 heading into the Cowboys game in Week 13. From that point forward, Brees posted a QBR of 55.3, placing him between Nick Mullens and Derek Carr. Could it be a blip, a small sample of middling play from an oft-excellent quarterback? Of course. Could it also be something similar to the late-season decline we saw from Peyton Manning in 2014 before Manning struggled mightily in 2015? That's also on the table. The Broncos still managed to win the Super Bowl with a compromised quarterback that season, and the Saints can win plenty of games in 2019 with their defense and an excellent running game. It's also fair to say that their highest ceiling comes with the Brees of old, and there are no guarantees we'll see that same level of genius at work next season. They're the Patriots. They won 12 or more games in eight consecutive seasons before 2018, and the only reason they didn't get to 12 wins was because the Dolphins beat them on a laterals play with all zeros on the clock. Yes, they will be in some level of flux. Rob Gronkowskimight retire. Stephen Gostkowski, Trey Flowersand Trent Brown are unrestricted free agents. Tom Brady is going to be a year older. They're likely going to lose defensive coordinator Brian Flores to Miami. You know what? I have faith Bill Belichick will figure it out, because Bill Belichick always figures it out. They're going to fall to earth one day, but it probably won't be in 2019.